The National Building Museum's Intelligent Cities Forum gathered experts across disciplines to explore the intersection of technology and urban life. 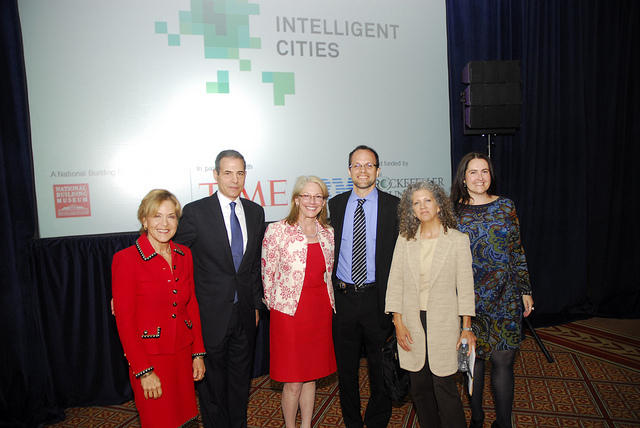 From left to right: Judith Rodin, Richard Stengel, Anne Altman, Dr. Xavier de Souza Briggs, Susan Piedmont-Palladino and Michelle Moore. Photo by Kyle Samperton. Published with permission from the National Building Museum. The National Building Museum held its Intelligent Cities Forum yesterday, an all-day event that brought together experts from across the United States to explore the evolving, deep-rooted connections between technology and cities. The event covered topics ranging from education and energy to public health and transportation, with feedback from planners, policy makers, technology professionals and academics. The main driver of many of the forum’s conversations was the use of data to improve the quality of life for city dwellers. What Makes an Intelligent City? The forum’s keynote conversation assembled an impressive panel of urban experts to explore the concepts that make cities “intelligent” in design and operation. Panelists included Anne Altman, general manager at IBM Global Public Sector, leader of IBM’s Smarter Cities Initiative; Dr. Xavier de Souza Briggs, associate director for General Government Programs at the White House Office of Management and Budget; Michelle Moore, federal environment executive at the White House Council on Environmental Quality; Susan Piedmont-Palladino, curator at the National Building Museum; and Judith Rodin, president of the Rockefeller Foundation. The moderator for the panel was Richard Stengel, managing editor at TIME Magazine. The panelists agreed that the ethical and proper collection, analysis and application of data, with the incorporation of technology and innovation, are important aspects that make cities intelligent. Anne Altman explained that data collection has changed very much since the 1950s. She said data collected back then was static: “We were looking at data historically to decide on how we would live our lives in the future.” Having real-time data available now changes the dynamic, she explained, while referring to IBM’s City in Motion, a project that captures information on how people live and move through the city using cell phone signals. By overlaying this data on a city’s geography, decision makers are able to understand where people spend their time in the urban landscape. Rodin pointed to Map Kibera, an initiative by young informal housing occupants in Nairobi, Kenya to create the first free and open digital map of the informal economy and residential patterns, as one example of the powerful and political realities of the use of data and technology. Kibera, a Nairobi slum, appeared as a blank spot on maps until November 2009, when residents of the slum started mapping their own community. The government simply did not recognize the slum, depriving its residents of political recognition and services. Moore further elaborated on this topic by pointing to data.gov, the U.S. federal government’s effort to increase public access to high-value, machine-readable datasets generated by the executive branch. The government may be collecting the data but perhaps a student is developing an application or widget to make sense of that data and apply them to solve problems, Moore added. Access the event’s agenda and speakers. You can watch some of the sessions here. Part of the forum included a competition by the 24-Hour City Project, a creative experiment in temporary urbanism and digital innovation that explores the intersection of data, arts and technology within the built environment. Three interdisciplinary teams put together physical and digital exhibitions to effectively visualize this intersection and the forum attendees voted for their favorite projects. The winner was Kashuo Bennett, who provided a three-dimensional visualization of Washington, D.C. that shows the rate of educational attainment around the city on to which other datasets are projected, like violent crime statistics. Bennett built the visualization using a parametric model in his lab at Virginia Tech, though the software and laser technology to build this structure is available through MIT’s travelling Fab Lab. One of the other contestants was A Wider Circle, a nonprofit organization that helps furnish the homes of families transitioning out of shelters or simply living without life’s necessities. In addition to helping families build a home, the organization’s efforts also direct furniture waste away from landfills, saving space. In collaboration with Development Seed, a creative research and development company that builds data-heavy websites using open-source technology, AWC built an interactive map displaying the donors and receivers of furniture. The company displayed their data as furniture tags and on the donated television set, in a living room setting. The final participant was Elissa Goetschius with her multi-dimensional plexi-glass screen displaying the images of interviewees juxtaposed with the audio of the interviews. 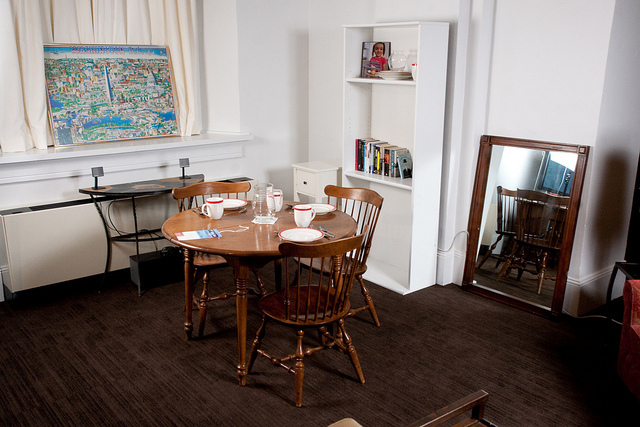 Using donated pieces of furniture, A Wider Circle set up a living room and displayed data on furniture tags and a map presented on the television. Published with permission from Development Seed.